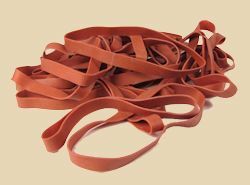 American-made heavy duty red rubber bands, 5/8" wide, packaged in boxes of one pound each. Piece count per bag varies with weight of individual bands by size. The last digit of the item number matches the rubber band's diameter in inches. Rubber bands are great for small or medium-sized molds (up to 10" on each side) that you use regularly, but rubber bands will oxidize and weaken over time. That can mean the bands aren't strong enough to properly hold together the parts of the molds. That can have dire consequences for your molds. The parts may warp away from each other, or the weakened bands may give way next time you pick up or move the mold. For all their size and weight, plaster molds are surprisingly fragile! Even without those problems, weakened bands may allow slip to leak between the mold parts. With large molds, that can lead to a real mess. For storing molds and for pouring large molds, we recommend nylon banding straps. Wrap the strap around the mold. Make sure it isn't twisted. End of strap goes through the BACK slot. Bend the strap forward OVER the crossbar between the two slots and DOWN through front slot. Adjust the position of the strap around the mold. You need a couple inches of slack around the mold. If it's too tight you may crush the mold in the next step! Flip the tongue plate forward to tighten the strap. It should not take major force to tighten and buckle the strap. Just for those "oops!" 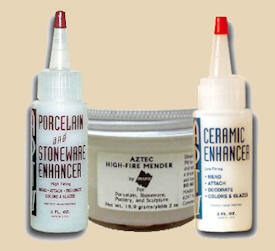 moments: these menders work best when mixed into a slurry with a small amount of the clay used in the piece you want to fix.